Pilot FriXion pens have been popping up everywhere I look lately. Are they really that good? Let’s find out, shall we? Hello, my productive pals, my goal-getting gurus, my Page Flutter friends, my jaunty journa–ok, this could go on for a while. Hey, everyone! I have a quick review for you today! 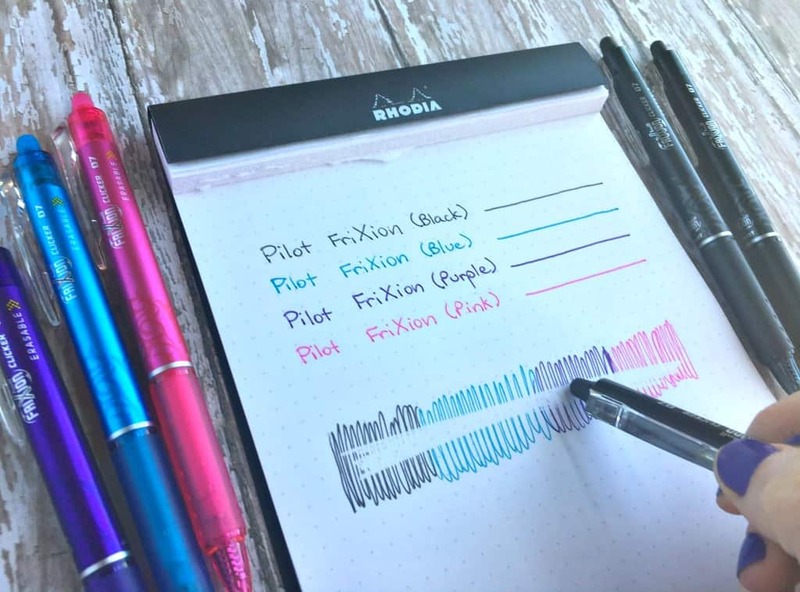 I put together a post of 10 Sure-to-Please Pens for Bullet Journaling a little while back, but I hadn’t tried Pilot FriXions yet. These erasable gel pens have been getting a lot of praise in various bullet journal forums, so I thought I’d check them out for myself. But first, let’s hit one of the big hiccups for many journal users: Mistakes. Mistakes are a prickly subject in journaling circles. 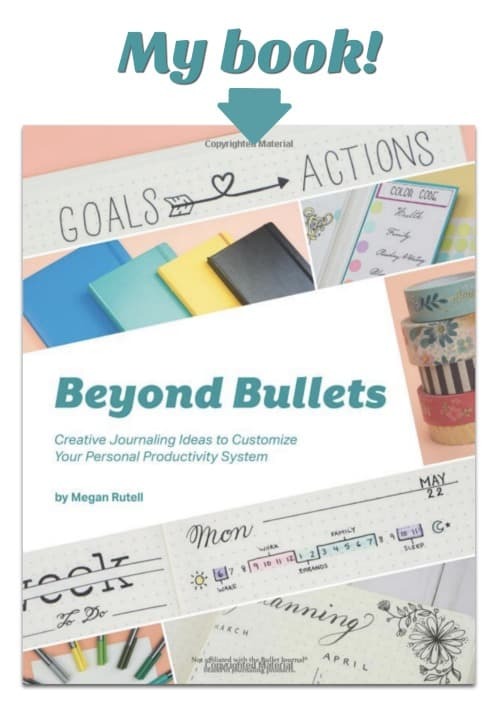 Most of us love admiring the artistic pages we see online, especially from bullet journal bloggers out there. These are exceptionally talented people who can make their pages come alive with ink. They’re tidy, impeccable designed, and almost always, mistake-free! It only makes sense that we see those pages and think, “If my pages looked like that, I could finally get things done.” But you make mistakes, right? Well, my first piece of advice is to make peace with the mistakes. They are a part of life, after all. >>Head over HERE to read my post about taking creative risks (mistakes and all). If that doesn’t work–and you really, really, really can’t face the spread when it’s a squiggly mess–an erasable pen is in order. There are many more colors available, and I think it’s safe to assume the other colors behave similarly to the ones I’m trying. 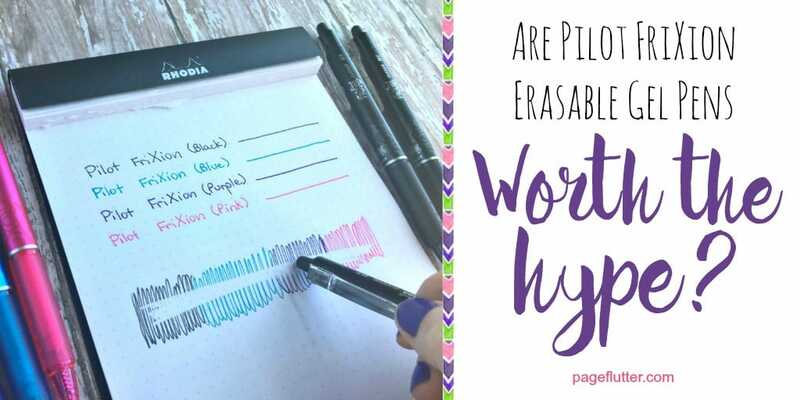 When I hear “erasable pen” I think of those old skinny, goopy ballpoints with the hollow erasers on the end. Remember those? They skipped on the paper, smeared like crazy, and dropped what can only be described as ink boogers. So, just to put your mind at ease, FriXion pens are NOT your grandma’s erasable pens. The first thing you’ll notice is that these are gel pens. They write quite smoothly, without sticking or skipping like a large ballpoint. 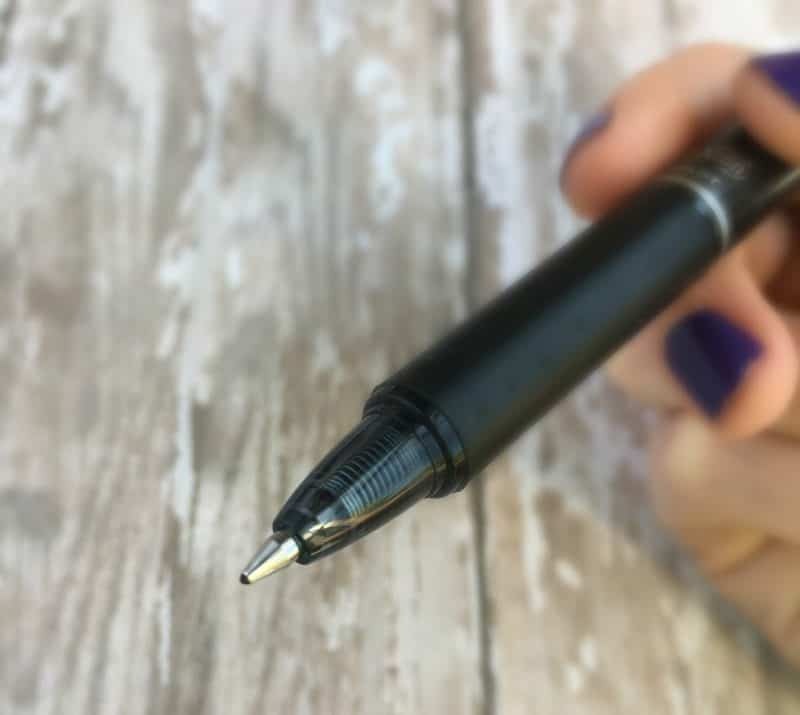 The lines are dark, crisp, and fine (although the black was not quite as dark as a Uni-Ball Signo, Vision or Pilot G2). FriXion packaging lists the tip as 0.7mm, and it writes like most other “fine” pens I’ve used. That’s just about the right thickness for me. I write quickly, but this pen keeps up nicely, no splotches, bleeding, or skipping. I tried the colored ones with equal results. It was a nice, smooth, clean writing experience. No complaints! 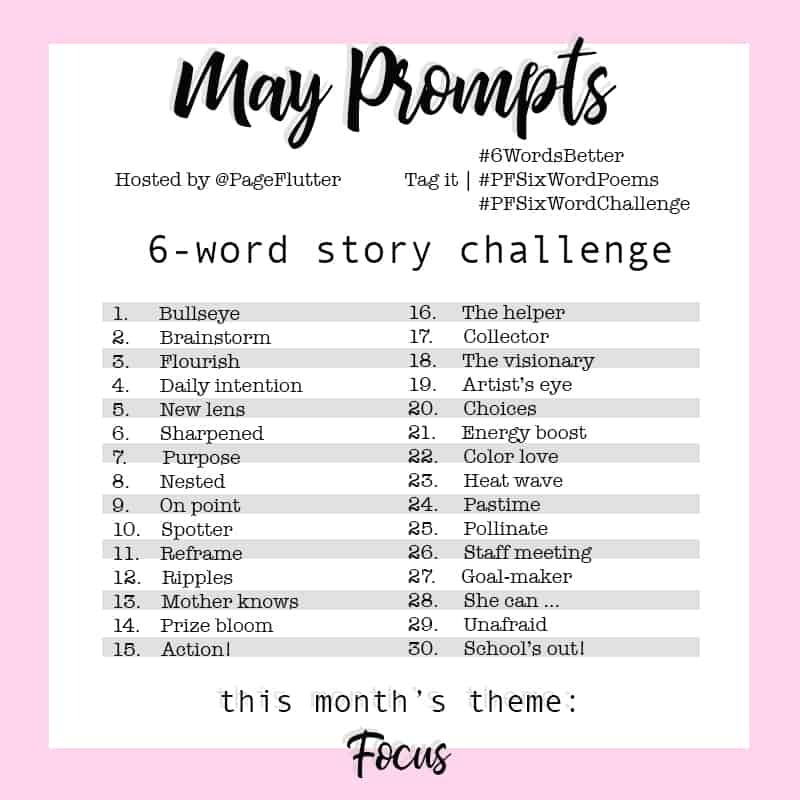 Ordinary Pencil: Friction rubs graphite off paper –> pencil marks are physically removed from the paper –> words can’t be brought back. 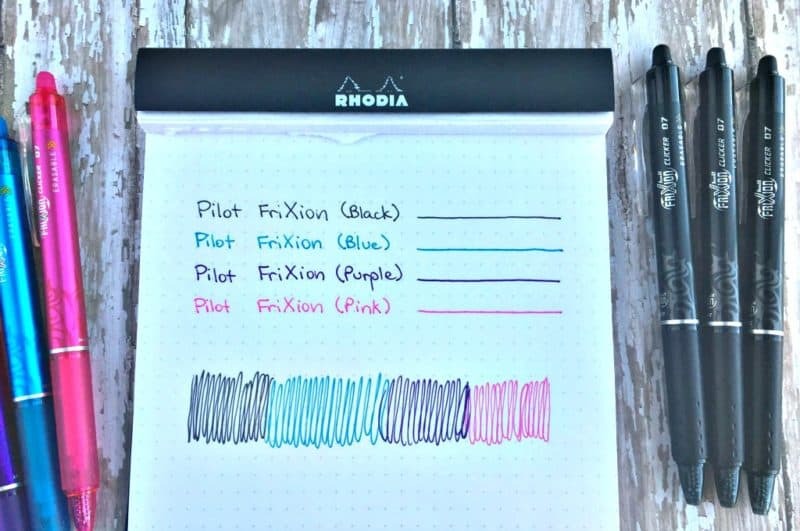 FriXion Gel Pens: Friction causes heat –> heat makes the ink turn clear –> ink is still on the page, you just can’t see it. Freezer test: So, if the ink is still on the page, does that mean you can bring it back? YES! After blasting the ink away with my hairdryer, I stuck my test page in the freezer for about 10 minutes. When I pulled it out, the ink had all turned back to its original color. 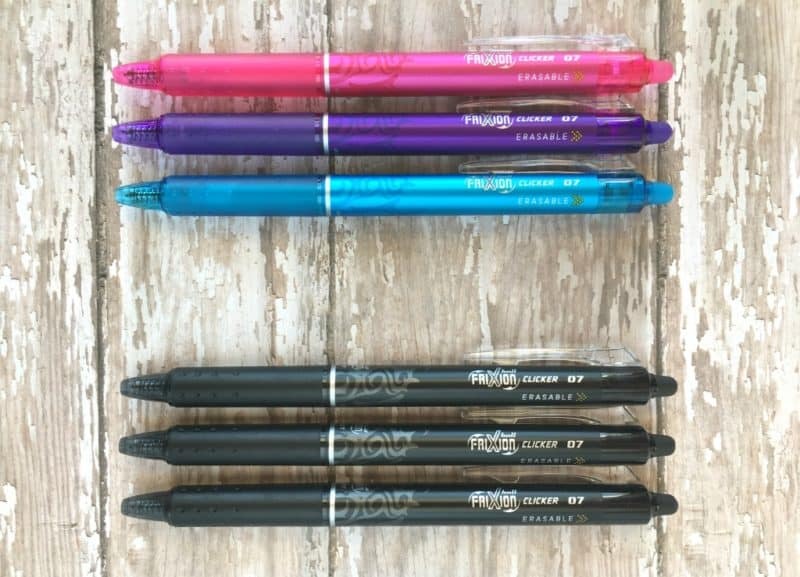 –>If you frequently leave your bullet journal/notes in a hot car, you might not want these pens. –>If you don’t want your “erased” spreads to reappear on your frequent Arctic expeditions, don’t use these. Other than those extreme conditions, these are great pens that perform very well! **I noticed some online reviewers felt they received dried-out pens, or highlighters that didn’t have any ink in them. If your FriXion products don’t write when you receive them, it’s likely they turned clear because of excess heat during shipping. You can stick them in the freezer for 20-30 minutes and they’ll return to their intended color. All things considered, I was very pleased with how these pens performed! I will definitely use these pens for note-taking. They won’t replace my Sharpie pens anytime soon (only because gel pens aren’t my favorite for journaling), but I’m also actively forcing myself to accept more mistakes. It’s helping my productivity. FriXions are a great option if you need smooth, dark lines with the freedom to erase. Over to you! Have you tried FriXion or another brand of erasable ink? Comment below to share your tips for stress-free journaling. 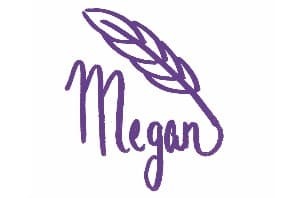 Subscribe to my newsletter for Page Flutter updates, posts, and announcements. Don’t worry, I only deliver the good stuff. No spam. Lol! ???? I can see how it could be a nuisance if your journal gets hot frequently. The good news is you can always stick it in the freezer and the ink will return. I love this article MJ! I filled out a planner spread with these and left it in my car. Needless to say it was gone after a hot afternoon. I rewrote everything with a papermate flair! I wish I had thought to google or something for the Freezer trick!!! I’m a little annoyed by how the black is not super black, I wonder if the markers are darker? I use the highlighters to ‘unplan’. When I write a task in my planner, I use a frixon highlighter on it. Then when I complete the task, I ‘erase’ it. I find the task being highlighted draws my eye better so I can see what needs to be done. Je pensais aussi que les frixion étaient le meilleur compromis pour mon perfectionnisme. J’ai testé le turquoise et le violet. Ils m’ont été utiles, mais je suis déçue de leur durée de vie : à peine 3 mois chacun ! Je comprends mieux pourquoi il y a autant de recharges en magasin..
Je suppose que les bonnes choses ne durent pas éternellement, n’est-ce pas? ? Translation of the above for my English readers: Abyna said she also thought the Frixion pens were the best thing for her perfectionism. She tested the turquoise and violet. They were useful, but she is disappointed with how long they lasted (3 months each). She now understands why there are so many refill cartridges on the market. My reply: I suppose good things don’t last forever, right? ?